Media captionKatrín Jakobsdóttir: "Brexit without a deal must be a very difficult position for the UK." The prime minister of Iceland has warned that the UK will be in a "very difficult position" if it leaves the European Union without a deal. 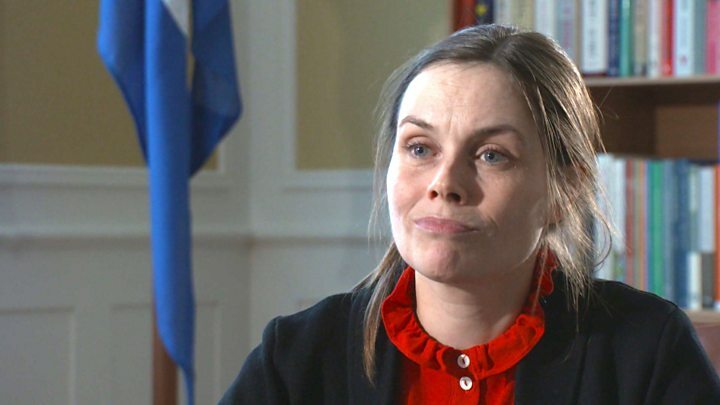 In an interview for BBC Scotland's new news programme, The Nine, Katrín Jakobsdóttir said a no-deal Brexit was "also a concern" for Iceland. She said this was because of close trading links between the two nations. Asked whether she thought Scotland could be independent, Ms Jakobsdóttir replied "absolutely". Although she said the decision was "not for me to take". Iceland is not a member of the EU but it has a close trading relationship with the bloc as part of the European Economic Area, along with Norway and Liechtenstein. That means the island nation is in the single market, accepting the free movement of goods, services, capital (money) and people to and from EU countries but it is not a member of the eurozone, instead using its own currency, the króna. It is not a member of the Common Agricultural Policy or the Common Fisheries Policy - crucial, says its prime minister, for a fisheries nation which wants to manage its own stocks. It is not in the customs union, meaning that it can strike its own trade deals with countries outside the EU. The prime minister, who is a member of the Green Party and opposes Iceland joining the EU, said this arrangement suited her country because it benefited from access to European markets while maintaining "space to do our own thing". Opponents say the arrangement is anti-democratic because the country is subjected to laws it does not write. But Ms Jakobsdóttir argues that Reykjavik does have a voice in the EU and, in any case, only about 13.4% of Iceland's legislation comes from Europe. "It's important to share some of the regulations with Europe," she said. Some supporters of a softer Brexit have argued that the UK could join Iceland in the European Economic Area after it leaves the EU - this is often referred to as the Norway model. But many voters who chose Brexit to "take back control" of the democratic process and to restrict immigration say that would be unacceptable. Iceland applied to join the EU in 2009 but later decided to freeze its application as it grappled with the effects of the financial crisis which saw its banks and currency collapse and unemployment soar. "After the crisis I think it was actually good for Iceland to stand outside of the EU," Ms Jakobsdóttir said. Still, she is clearly worried about the effect of Brexit on the Icelandic economy. "It's always bad to have uncertainty," she said, stressing that the UK "is a very important trade partner for Iceland". "Brexit without a deal must be a very difficult position for the UK. "So therefore it's also a concern for us, both because we have economic interests but also because we think of the UK as our friend in the world." Asked about the prospect of Scotland one day joining Iceland as a sovereign state in northern Europe, Ms Jakobsdóttir chose her words carefully. Iceland became sovereign in 1918 and gained its full independence from Denmark in 1944. "I think it actually made all the difference for our history," she said. "Of course in these issues I don't think size matters." So Scotland could be independent? "Absolutely, absolutely...but that's not the decision I'm going to make," she said. "It's a very sensitive issue." "I have also left-wing friends in England who actually are very opposed to the independence of Scotland because they say we need all the 'left' we can get." The prime minister praised the economic policies of the devolved Scottish National Party government in Edinburgh as "very interesting and promising for the future". She added that the two countries were part of a group of countries and parties co-operating on left-wing economic solutions for the 21st century. During the 20th century, economics was not always "in harmony with social needs and the reality of society," she said.